An 800-person rally at a new Perth children’s hospital site might have been eluded if the building contractor had publicized the results of a safety test, the construction union says.Workers at the Nedlands site put their tools down on Friday after the Construction, Forestry, Mining and Energy Union claimed contractor John Holland backed out on a verbal agreement to obtain an independent engineer’s review into a near-fatal crane accident last Tuesday. 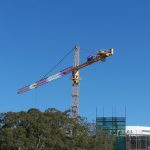 The accident was reportedly caused by a fitting failure on a tower crane that brought down a two-tonne block and 50m of rope that almost landed on workers.The CFMEU said Holland agreed to share safety information relating to the crane but went back on his agreement, which resulted in the strike. Fair Work Australia became involved and ordered an stop to industrial action until the issue was settled.Despite Holland’s promises to contract an independant engineer to conduct the report, Holland has allegedly conducted their own tests on the crane and did not share the information. “If they had stuck to their verbal agreement, none of this (action) would need to have happened,” the CFMEU said in a statement. “The incident which caused the dispute was immediately reported to the relevant workplace safety authorities and we continue to fully co-operate with authorities in their ongoing investigations,“ John Holland group managing director Glenn Palin Palin said. The site has been granted permission to continue work.